I aim to convey the beauty of biology. I'm inspired by all the bits I encounter, and I want to share them. If anyone tells you that life is anything besides absolutely magical - they couldn't be more wrong. This is my little sister Lila Jane and I a few years ago playing put-put. Shes adorable. The course has all kinds of castles and pirates, but Lila's favorite are the giant lizards. Did you know that lizards don't have lips? Nope, no lips. This lucky lizard was getting lots of love from a sweet little mammal, but giving none in return. Why don't lizards have lips? Well, they don't really need lips. But lets start at the beginning. This makes me so happy. 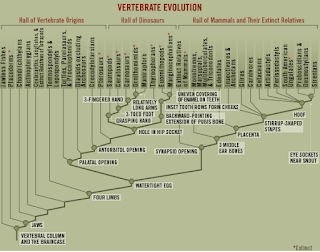 Its a cladogram of a collection at the American Museum of Natural History showing the evolution of vertebrates. The transition from aquatic environments to terrestrial is one of my very favorite things to think about, this highlights the story as well as demonstrates how DINOSAURS EVOLVED. Woah, yeah, dinosaurs. Whats even better, is that I'm learning the nitty gritty story behind all this in my classes this quarter. As the population of sharks has depleted, fishermen are turning more and more to Manta Rays - animals unfit, in the most Darwinian sense of the word, to handle the pressure. Hi, I'm Ella. Thanks for stopping by my blog. Why are we both here? Hopefully because you love biology as much as I do. I studied ecology, evolution and marine biology at University of California, Santa Barbara. I trust the scientific method, and the laws of physics. That being said, I think that life, our universe, and human compassion are nothing short of magic. I also believe that science is much more fun when you can share it with others. Biology? Yes. I love it all. Elephants, whales, birds, bees, frogs, early tetrapod evolution, sexual selection, mating dances, deep sea biology, conservation, evolutionary morphology, physiology, anatomy, anthropology, sea shells, ammonites, crinoids, skeletons, fossils, consciousness, feathered dinosaurs, carbon sequestration, marsupials... plus crystals, volcanoes, asteroids, and deep space... join me in my obsession and follow obsessionBiology. 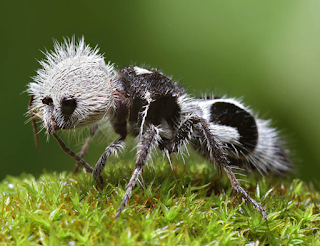 A panda ant? I just had to find out more about this insect. Surprisingly this charismatic "ant" was difficult to find, and involved translating a lot of spanish text. Alas I discovered this "ant" is actually a wingless wasp from Chile. The specimens collected and cataloged in the Virtual Biodiversity Insectarium were hermaphrodites about 8mm in length from a near coastal region in central Chile. Pretty cute for a wasp.. but its interesting how similar it looks to this Thistledown Velvet Ant, Dasymutilla gloriosa found in Mexico, California, Texas, Utah, Nevada, and Arizona.